Salem City Hall is located at 93 Washington Street, Salem, MA 01970; phone: 978-745-9595. The City Hall Annex is located at 120 Washington Street, Salem, MA 01970. Photo: Rufus Choate House, ca. 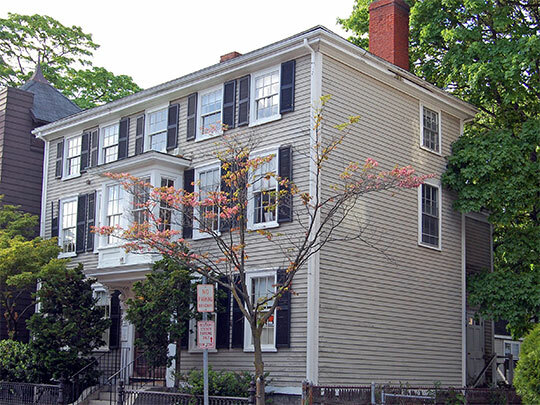 1787, 14 Lynde Street, Salem, MA. Listed on the National Register of Historic Places in 1982. Photographed by User:Fletcher6 (own work), 2010, [cc-by-3.0 (creativecommons.org/licenses/by/3.0)], via Wikimedia Commons, accessed October, 2013. Salem was first settled in 1626. At first, Salem township comprised all territory later embraced within the towns of Beverly, Danvers, Manchester, Marblehead, Middleton, Peabody, a part of Topsfield, Wenham and Lynn. The deed of Salem was secured from the Indians for the sum of £40 sterling in 1686. The city hall was constructed in 1838; the City Charter was accepted April 4, 1836. The settlement of Salem may be dated 1626, when Roger Conant and his faithful companions, leaving Cape Ann, took up their temporary residences at Naumkeag, as Salem was first called, or it may be dated September 6, 1628, when John Endicott cast anchor in Salem harbor, as governor of the colony, sent out by the Massachusetts Company in London, of which Matther Cradock was governor, to make a permanent settlement on the shores of Massachusetts Bay. Salem, like Plymouth, was never incorporated as a town. It was recognized from the first by the court held at Charlestown, August 23, 1630, as a distinct plantation or town, and was exempt from the common charge for the support of the ministry, which office was then held by Reverend Mr. Wilson. Its charter as a town was not questioned upon the arrival of Winthrop in 1630, but its bounds were not yet defined. Even though the town was never officially incorporated (but was so recognized from the first of its history) by an act passed by the General Court, the town of Salem chose, at a meeting held on June 19, 1637, a "committee of 12 to manage the affairs of the town." An act to "establish the City of Salem," was approved by Edward Everett, Governor, March 23, 1836. Salem began its architectural history during the transition period in England from Early to Classic Renaissance, so that two influences were almost simultaneous in American building. That one really preceded the other, however, and was of short duration seems to be proven conclusively by the scarcity of examples as compared with the abundance of houses of every later type. The first Salem houses of note, therefore, were patterned after the Elizabethan and Jacobean types developed during the periods 1558-1603 and 1603-1625, when some of the Tudor characteristics of Perpendicular, the last phase of English Gothic, were combined with classic orders and ornament considerably modified and subordinately used. The English class, or so-called Georgian, was adopted a few years afterward, and took unto itself American characteristics no less distinctive than those adapted from earlier sources. Thus the transplanting of the rambling Elizabethan dwelling and its construction entirely of wood gave us the little less picturesque many-gabled houses of Salem which have been immortalized by Nathaniel Hawthorne in The House of the Seven Gables. Many, probably most of these quaint houses were not originally built in their final condition, but like their British prototypes represented the result of successive additions to meet the needs of growing families and other requirements. The beginning was usually a simple roof structure from which wings and second story gables were thrown out as occasion demanded. Benjamin D. Hill and Winfield S. Nevins, The North Shore of Massachusetts Bay, An Illustrated Guide, 4th Edition, Salem, MA, 1881. Francis Cousins and Phil M. Riley, The Colonial Architecture of Salem, Little, Brown, and Company, Boston, 1919.